The many challenges faced in organ donation and transplantation are explored in this resource-filled yet uneven book aimed at individuals and organizations involved in the process. 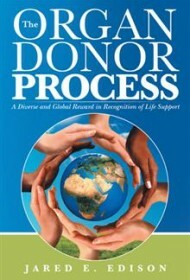 In this slim volume, the author explores the processes and procedures of organ donation and how they affect donors, recipients, family members and health and medical researchers. One big problem is a donor shortage, which author Jared E. Edison believes stems from a lack of education and information. The book touches on ethical issues regarding the concept of brain death, the complication of organized crime in acquiring organs and determining the recipients, and the use of animal organs in humans. Through information obtained in recorded interviews, personal observations and surveys, the author also addresses biases against ethnic groups and nationalities and unethical behavior by some organizations. Arranged in the mode of a research project, Edison’s book brims with quotes and passages from numerous sources and concludes with several appendices, including a list of organ donor research programs, a bibliography and recommended resources. However, some sources are dated, going back as far as 1992. While steeped in academic-like prose, Edison also offers unscientific personal asides that are jarring. For example, he states in this awkwardly constructed excerpt: ” I believe not one family in need of an organ donation would care less about the color or race of the donor. Well, let us not be too hasty, as later in this chapter, the situation climaxes to more disbelief.” Such diversions dilute the authority of his more formal presentation and create an identity issue for the book: Is it a serious, academic work, or a personal plea? Overall, the book would fare better if it stuck to its more serious tone, eliminating both older data and personal commentary and its identity crisis at the same time.